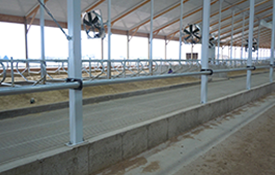 Freudenthal Diagonal Feed Thru Panels are designed to minimize feed waste with our slant bar panel system. 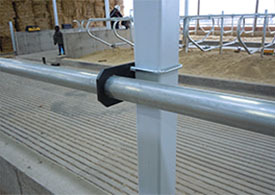 The animal's head stays over the feed manger instead of dragging feed through the panel. 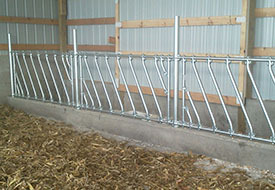 Our Panels are made of the highest quality tubing manufactured. 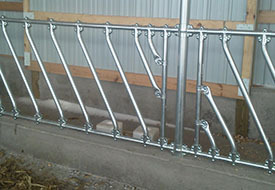 The entire Panel is constructed of 1 5/8" 10 gauge high tensile strength hot dipped galvanized steel with 3-bolt tee clamps top and bottom for neck space adjustment. 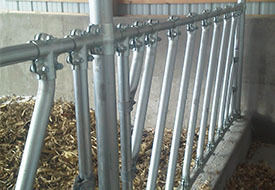 These are the heaviest strongest Diagonal Feed Thru Panels manufactured in the Dairy industry. 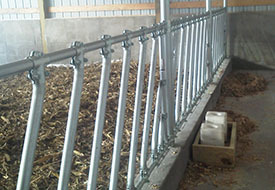 Heavy duty feed rail system. 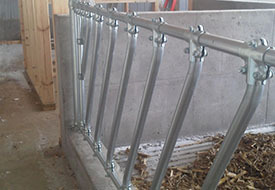 You have the option of using 2 3/8" or 2 7/8" hi strength galvanized feed rail pipe. 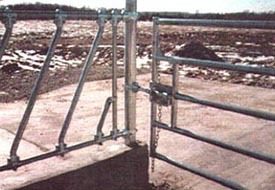 Mounting brackets available to adapt to any post round or square.